Rarangi is a gentle and easy walking course. It is typical of the New Zealand country course many of which sprung up in the 1950’s . These were the boom years for sporting club activity of all kinds and golf experienced a huge expansion. There were no real professional sports activities apart from racing then, so if you wanted to play something a group would get together and just do it. Rarangi was conceived within this philosophy. They raised the money, turned over the ground, sowed the grass and planted the trees. There was always a builder to put up a shed and someone who could make old motors roar into life again, with new appendages bolted on that would mow fairways and greens. There was no money or access to get flash machines from overseas. You needed an import permit anyway. The members paid subs that helped pay the wages so the important day to day jobs could be looked after. At the weekends you went down to the club and had a game. Some clubs were more fortunate than others. Rarangi had the drive and resourcefulness of men and women who had come through the depression and war. They had grown to run businesses of their own. Their contacts where like gold mines and central to the success of the growth of the community at that period. The features of Rarangi have developed over the years but the core ingredients that have made this an attractive course to play are still the same. It is a brilliant all weather golf course, the soil which looked a problem in the beginning has been it’s greatest asset together with care and good on going turf management, plus natures blessing. There is no other golf course like it in the province. The greens as good as the best metropolitan courses. Then there is the weather. At Rarangi you can play every day of the year. Sometimes it is like playing on your own private course, so far from the maddening crowd. The Founders: In late 1956 a small group led by B J Hipkins looked for a block of land suitable for an 18 hole all year golf course. A possible site of 120 acres, located at Rarangi was found. Chaytor and Co was the owner and Mr Chaytor, after some negotiation, said he would sell for £1200. A meeting was held at B J Hipkins’ residence in January 1957 to discuss the formation of a club and purchase of the Rarangi property. The meeting unanimously decided to proceed with purchase and to form the Rarangi Golf Club. J P Enright, H Hester and J V Hipkins, secretary and treasurer. A further twenty or so enthusiasts were to be approached to be foundation members paying £20-£50 as an initial subscription and bank account was open. 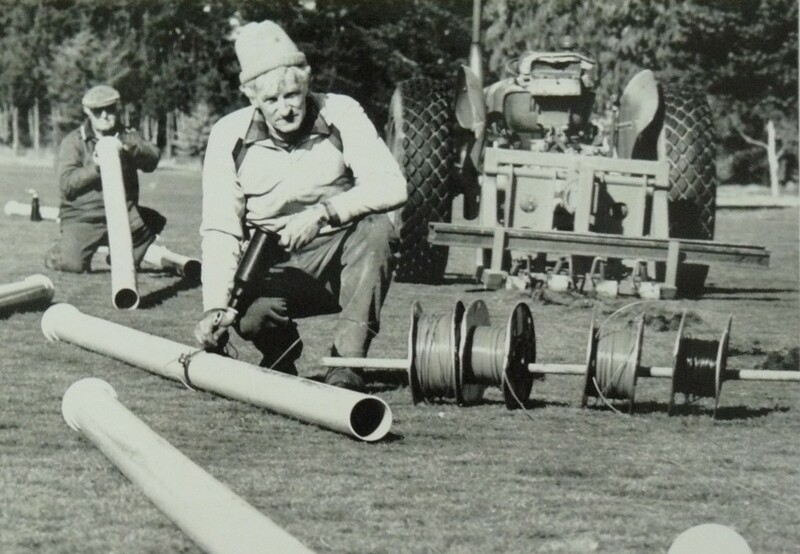 Along with many others Mr Chaytor had some doubts over the viability of establishing a golf course on what appeared to be an inhospitable 120 acres covered in matagouri, manuka, briar and stones. An easement to be registered from southern swamp boundary to the road along what is now Mr & Mrs Olliver’s property. The right to repurchase the land in the event of the clubs failure within 10 years at the original price. Neither clause was ever invoked. The first working bee was on the second Sunday of February 1957. Reality now set in. The wilderness had to be cleared. Many hours over the next two years went into the laborious task of clearing matagouri, other shrubs and tons of stones. With the ground cleared, the pea gravel was exposed almost everywhere. Many yards of topsoil was carted and spread. Thousands of bags of reject seed donated by local merchants were also spread. The spreading of seed carried on until the 70’s. At this time, 1959, we were visited by a North Island soil and grassland expert renowned in his field, who said, ”Sorry Gentlemen, you will never grow grass here.” He did not take into account the determination to prove the doubters wrong. The Ladies also shared that determination and would frequently walk from Chaytors corner gathering yarrow seed heads for sowing on the course. The generosity of members continued, giving up much time to working bees. With the land cleared, an invitation was extended to Mr A R Blank, President of the NZGA, and a well known designer of many of NZ’s better courses to design Rarangi. After completing his design he reported to the Marlborough Express, “That he was pleasantly impressed with the area and with the establishment of the links. Rarangi would give a needed fillip to golf in Blenheim”. With a few minor modifications the layout is the same today.